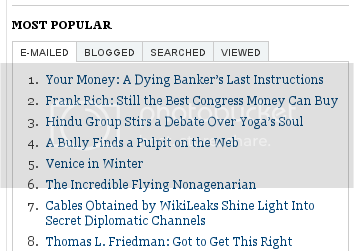 The article which was e-mailed more than the WikiLeaks article or Thomas Friedman’s column on the The New York Times website yesterday was titled Hindu Group Stirs a Debate Over Yoga’s Soul. Over 15 million Americans practice yoga and it is a 6 billion dollar industry. What is taught mostly is Hatha Yoga, but without the “baggage of Hinduism“. The Times article describes the activism of second generation of Hindu-Americans and what it has achieved. Even months after the initial launch of this campaign, the issue remains very much alive. On September 23, David Waters, the former editor of On Faith, quotes heavily from HAF’s stance paper in his piece “Should Christians practice yoga? Shouldn’t everyone?” And on October 3, Ms. Shukla once again voiced HAF’s stance in the “yoga debate” on air in a segment on Common Threads (click here to listen to Part 1 of the recorded segment and click here to listen to Part 2).